Never mess with a woman who knows how to summon a demon, and not just any demon either to get revenge on you. Graces scum of the earth boyfriend Michael finds this out the hard way when she summons Caspian, a Crown Prince of Hell to get back at him. This book had everything going for it: a witty, independent heroine, a smokin hot alpha male, a cringe worthy villain, and lovable secondary characters. This book should have been an instant favorite with me. However, what started to lose me was this: the plot itself was predictable, but I didn't mind that because I enjoyed Caspian and Grace so much. What I did mind though was that the mystery was revealed to the reader before it was revealed to Grace, so the whole book is spent waiting for her to figure out it. There are some emotional scenes with Grace when she finally gets a clue as to what is really going on, but for me it was too late. However, I liked Grace and Caspian so much by this point, that I kept reading because I really wanted to see Michael get what he deserved. He was such a fun villain to cheer against. The other thing that lost me was that every.single.character. had their own chapter. Even the villains minion, minon girlfriend had her own chapter. Granted, everything came together in the end, but it made hard to fully connect to the main characters. 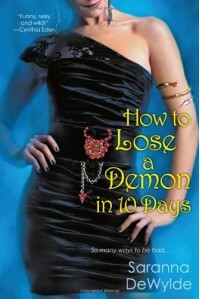 How to Lose A Demon in 10 Days was original, and for a debut book wasn't bad. I think I was just frustrated because I wanted a lot more of Grace and Caspian together and all the other characters kept getting in the way, lol. I requested book two in this series at the same time that I did this one, and while I had major issues with this book, I am actually looking forward to reading it because Grace and Caspian were so much fun.